I’d driven towards a promising looking lake to the South-West of where I’d arrived in Spain. It had a few small towns surrounding it and was bordering a National Park so looked like a good location. I saw the lake approaching on my left and took the first small path I could find. It was pretty bumpy but after a few minutes it opened out. 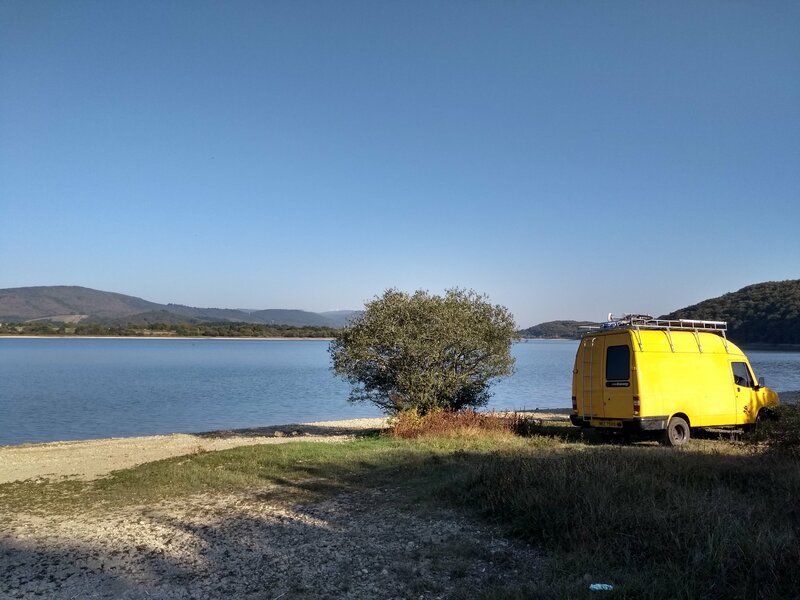 I parked up by the side of the lake and got out of the van to have a proper look around. The lake looked nice but had obviously dried up quite a bit leaving the bank muddy and rocky. I sat for a while and then heard a dog bark. It kept barking for a few minutes. I’m not sure what it is but a dog barking just really grates on me and at that point, not being familiar with the country, it really put me on edge. I decided to move. I drove back the way I had come and then followed another, smaller path that looked like it led towards the lake. After about 5 minutes I could see the lake approaching on the left. I stopped the van and got out. This area looked much more promising. The lake was much prettier here and there was a beautiful view out towards one of the neighbouring towns. The only issue was there was a rather steep hill which I’d have to manoeuvre down to get to the beach. I decided to check out what was further down the path. Further along, the track got really bumpy, to the point where I’d actually written off driving down here. There were huge dips in the path which just looked way too much for Vince to handle. I decided to explore anyway and noticed another little track leading down to a pebbled beach. It was mostly flat and looked ideal for camping. The view was stunning and the cool water of the lake looked clear and inviting after a hot few hours exploring. I walked down the path and further along the beach where the beach opened out. I noticed a rowing boat and a guy that was completely naked walking around. He had a small speaker and was blasting System of a Down. Not wanting to disturb him I began walking back to the van and like that he jumped back into the rowing boat and rowed back to the other side of the lake. The whole thing was quite bizarre! I stayed a few moments longer to get a feel for the place. It was quiet and calm and I really wanted a swim in the lake. I had a vision of getting up early in the morning, watching the sun rise and swimming. I reaaaally wanted to camp here! I walked slowly back to the van along the treacherous path. I pondered if it would be possible to get the van down to the beach. The path alone was bad enough but the hill leading down to the lake side was really steep, I wasn’t sure if I could make it. It took me a while of sitting in the van before I decided I was going to attempt the path, telling myself that if took it slowly then it should be OK. I’d tackled some pretty steep mountain paths the day before so I was reasonably confident Vince could handle it. I was still nervous. What would happen if I got stuck, or worse, if the van tipped over! All of my hard work, money and months of planning would be gone. There was a lot at steak but if I could get down to the lake it would be an incredible place to camp. I was tired from driving and really didn’t fancy trying to find another spot… I took a deep breath and started the engine. The van lurched slowly from side to side as I drove up the track. Every creak, every slight knock made me flinch. I was on high alert, just waiting for something to go wrong. A hundred metres down and everything was fine. Two hundred, still OK. I started to relax a bit, Vince was handling this like a pro, maybe I was being over cautious. I stopped at the steep hill leading down to the beach. The ground was pitted and bumpy with deep tyre tracks from previous expeditions. I steadied myself, this was the last hurdle. The last obstacle between me and a beautiful camping spot, away from roads and people and dogs where I could get a good nights sleep, have a swim and relax after the stressful previous days. Gently, I approached the crest of the hill, dipping the clutch as not to drive to quickly over the top. The van leaned to the left but felt stable. I carried on, slowly inching over the top. The nose of the van dipped. It felt like a roller coaster just at the point where the carriage tips over the peak and dives towards the earth. My foot firmly on the brake I carried on at a snails pace. I felt the back wheels move over the crest of the hill. So far, so good. Cautiously I continued. It was OK, I was doing this and Vince was fine! After what seemed like forever I got down to the beach, I could feel my heart beating, sweat was running down my face but I’d made it. I drove down so my side door was facing the lake, took off my clothes and jumped into the water. It was so cold but felt amazing after the epic mission to get there. In the morning I was rewarded with a phenomenal sun rise. Sometimes taking a risk is well worth it! I also learnt that Vince can handle a lot more than I thought and what seems like an un-drivable path can be fine if driven slowly and with care. I think I’ll still be as scared next time!